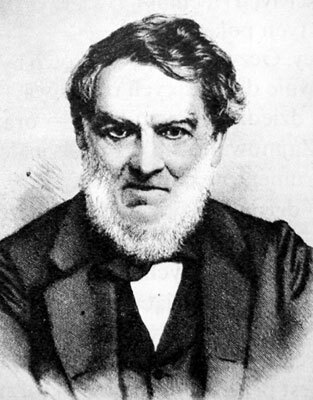 The Polish economist, financier, linguist, engineer and inventor Jan Józef Baranowski (see the biography of Baranowski) was the author of many technical inventions, 17 of which have been patented in France. Interestingly, at least 4 of them are for calculating devices: Machine propre à obtenir les produits des nombres sans faire la multiplication (Brevet №4587 from 1846), Montre à calcul opérant les quatre règles de l'arithmétique (Brevet №2663 from 1847), tax machine from 1848 (taxe-machine pour obtenir les résultats des calculs les plus compliqués même ceux des changes et arbitrages de banque, avec un contrôle instantané), and a machine for calculation of the votes in the elections from 1848. 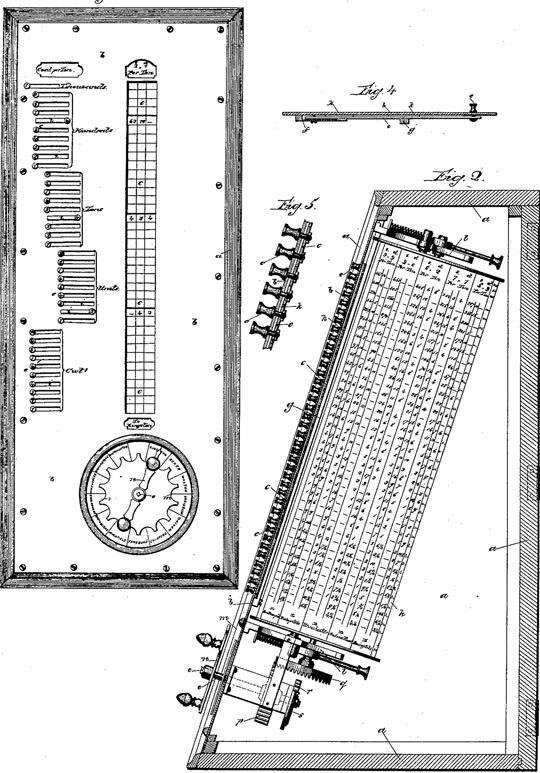 The first calculating machine was patented in USA also (US patent 5746 from 1848). The Baranowski Tax Machine (see the lower photo) was built in France circa 1849, and was used for general employee payrolls. The machine was awarded a medal in 1849 at the French National Exhibition in Paris. The machine for calculation of the votes in the elections of Baranowski (see the lower patent drawing) was designed in 1849. Actually Baranowski designed 3 different voting machines, the simplest being a box, containing a simple counting mechanism, where the voting boot had to be equipped with 1 box per candidate and the voter had to turn the crack at the counter of his favorite candidate. His second machine allowed for binary decisions, while the third machine was designed for choosing between more than 2 alternatives. 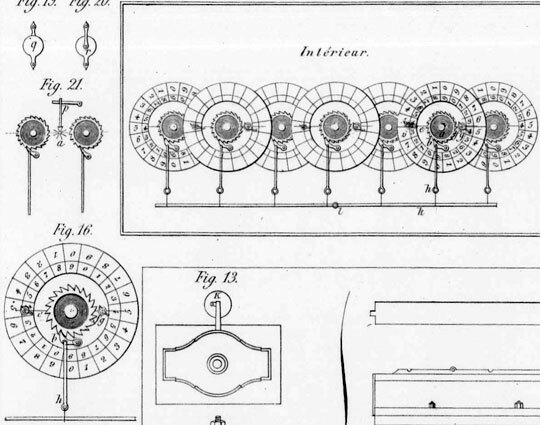 Let's examine the first reckoning machine of Baranowski, using the US patent (see the drawing below). The first reckoning machine of Baranowski consists of a commercial table or ready-reckoner containing the various results previously calculated and arranged consecutively in units, tens, hundreds, etc. 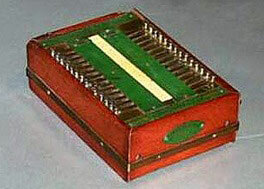 (as well as in fractional parts, when desired) of suitable apparatus for bringing the numbers of such table into view, of a face-plate with openings formed in it to admit of any portion of such commercial table or ready-reckoner being seen when required, and, lastly, of a number of accurately-fitted slides, any number of which can be withdrawn for the purpose of exhibiting the numbers constituting the required result, the other numbers not required for the result to be ascertained being concealed from view. The slides and the face-plate are so adapted and arranged that the operator may readily see from the front of the machine which slide to withdraw in order to disclose any required result. The operation of the machine, then, consists in the display of the particular result required on the withdrawal of the proper slide by the operator when such result is to be exhibited by a single number or sum on the tabulated surface; but when the result is to be exhibited by or consists of two or more numbers, then two or more proper slides have to be withdrawn, by which the two or more numbers are displayed, which being added together give the final result, and the same principle is to be followed to any extent required, the machine being of course adapted to the particular kind of tabulated surface to be used with it. Thus the ascertainment of the result by means of the machine becomes reduced to the simple operation of exhibiting to view the number constituting the result required or the numbers to be added together for such result with the greatest facility. 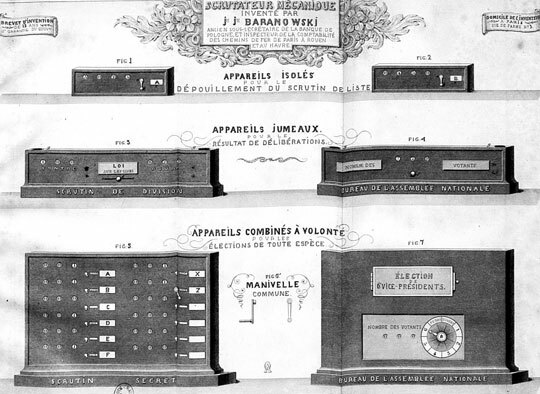 The second calculating machine of Baranowski (see the lower patent drawing) was a simple adder, similar to the earlier machine of de Lépine.